In the first of four features telling the histories of London streets, we look at the story of Smithfield, which in medieval times was both the Trafalgar Square and Wembley Stadium of its day - with added mayhem. A short walk north of St Paul's, the space now called West Smithfield is today a largely bypassed square and park. But in medieval London, Smithfield was regularly filled with the roars of crowds, regal fanfares and rowdy games. The area was used for public gatherings including sporting occasions, fairs and even executions. The three great institutions that dominate the area now - the meat market, St Bartholomew's Church and St Bart's Hospital - were all established in Smithfield by the late 12th Century. Today's meat market, with its grand Victorian halls, has evolved from what chronicler William FitzStephen described in 1174 as a "celebrated rendezvous" where country traders went to sell cows, sheep, pigs and agricultural goods. It was also where earls, barons and knights were "drawn to the show and sale of fine horses", he said - and in one of the earliest records of horse racing, young men would gallop around the open space. The church, a gem that is now hidden behind an ancient gatehouse, was founded as an Augustinian monastery in 1123. 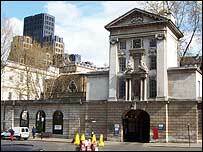 St Bart's Hospital was established with it - but has long since outgrown its origins. At 300ft long, the church was bigger than many cathedrals. Although damage and alterations have reduced its size, its original choir is one of London's oldest remaining structures. Reports of miracles - where the first prior would cure bizarre ailments - spread fast in its early days, and served to enhance the church's reputation and coffers. Within a decade, pilgrims and the sick gathered there on St Bartholomew's Day and an annual cloth fair sprang up in the churchyard. The cloth fair was hugely important for merchants, but the myriad of stalls, plays, freak shows, music and chaotic revelry that grew up around it soon became the main attractions. Known as Bartholomew Fair, it was one of London's most famous holidays until it was closed in 1855. Smithfield also attracted crowds for its lavish jousting tournaments, which were laid on by kings and became important diplomatic and ceremonial occasions. The ground at Smithfield would be levelled, wooden stands erected and competitors marched there through the city led by trumpeters, minstrels and noble ladies. But Smithfield was also home to more terrifying spectacles, when heretics, rebels and criminals were burnt, beheaded or boiled. Scottish hero William Wallace was hanged, drawn and quartered after being dragged there behind a horse in 1305. 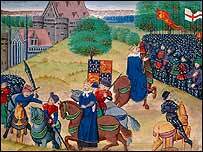 And Peasants' Revolt leader Wat Tyler - whose army had gathered there - was stabbed by the Mayor of London in 1381. 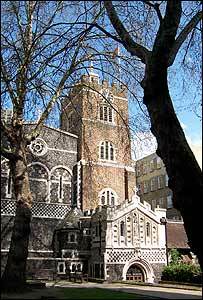 The injured Tyler was taken to the hospital at St Bartholomew's Church - but dragged out again and beheaded. Smithfield had always been used for the gruesome executions of criminals and religious martyrs, but this reached a peak when more than 200 protestants were burnt at the stake during Queen Mary's reign in the 1550s. Today, the area is a peaceful, hidden corner of London - but some things give a glimpse into its past. 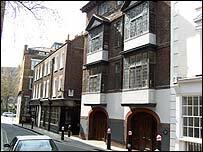 The street of Cloth Fair - which runs alongside the church - has evocative buildings and lanes that have survived both the Great Fire and the Blitz, including London's oldest lived-in house. The house, at numbers 41 and 42, was built between 1597 and 1614, according to its current occupant, architect Mr A Cenci. "It was preserved from the Great Fire because it was all enclosed by the wall of the priory," he says. "In 1880, the whole of the street was like this - but the Corporation [of London] decided it should clear the slums. But this one was saved." Smithfield in the 21st Century has a mixed population - including judges, writers, butchers and the residents of the local homeless hostel - he says. "It's quite villagey - everyone knows each other. For the city, it's very residential."